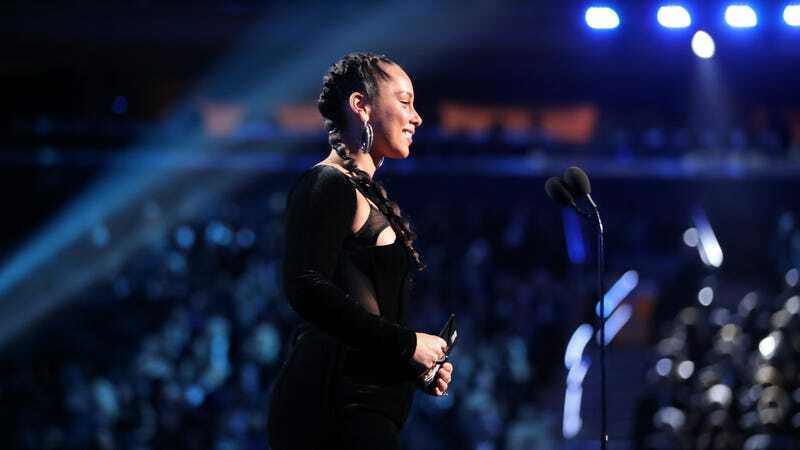 Alicia Keys speaks onstage during the 60th Annual GRAMMY Awards at Madison Square Garden on January 28, 2018 in New York City. The performance lineup for the 2019 Grammys may be “in flux,” but we know there will be plenty of showing out (and likely, plenty showing, in general) on the ceremony’s red carpet this Sunday. From meat dresses to all-sequined everything, as always, we’ll be there watching. As you may know, The Glow Up is The Root’s nexus for black woman magic, and the 2019 Grammys promises to offer plenty of the same, with confirmed performances by Cardi B, Janelle Monae, H.E.R., Honoree Diana Ross and Alicia Keys assuming hosting duties for the evening. Sounds like a celebrity sister circle, to us! And you can join us for the festivities by joining The Glow Up’s Facebook group, where our homegrown panel of armchair fashion critics will be running down our hits and misses among the music industry’s elite. The fun will start at 5:15 p.m. ET—so now’s the time to make that request to join!